Average Weight	: 8 - 12 lbs. Photo Courtesy of : True Heart MinPin Rescue, Inc.
All Miniature Pinscher Service, Inc. The Miniature Pinscher originates from Germany and records show it goes back hundreds of years where it was developed and designed to kill rats in homes and stables. The Miniature Pinscher is NOT a smaller version of the Doberman Pinscher, even though their looks are quite similar because both these breeds had some mixture of German Pinschers in them when first designed. In fact the “Min Pin”, as they are known, is a much older breed than the Doberman. The Miniature Pinscher was developed from the Dachshund, Italian Greyhound, and the shorthaired German Pinscher. It is believed to have first been called the ‘Reh Pinscher’ because of its supposed similarity to a Reh - a small deer, that inhabited the Germany's forests. The breed was used as a barnyard ratter, controlling the rodent population in the stables. From 1905 until World War I, the Miniature Pinscher rapidly grew in popularity in Germany. After World War I, breeders in Germany and also in the Scandinavian countries worked to improve the line. Around 1919, the first Miniature Pinschers were imported in the United States. Only a few were shown in American Kennel Club dog shows at first. But by 1929, the Miniature Pinscher Club of America, Inc., was formed, and they have grown steadily in popularity ever since. The Miniature Pinscher is often called the "King Of The Toys”. Some of the Miniature Pinscher's talents are competitive obedience, watchdog and agility. •	Min Pins are sturdy little tykes with a dynamite personality & have no problem being Alpha & ruling over you and others in your family. •	Bred to hunt rats and other vermin they have a ‘feisty’ personality. •	Training and socialization is necessary to stay ‘on top’ of this breed. •	Energetic and full of vigor. Curious and a skilled escape artist. •	Should never be allowed off-leash: will dart/chase after anything moving. •	A good watchdog, suspicious of strangers. •	Good with other dogs if socialized early and properly. •	Not suited for small children. •	Sensitive to cold climates, prefer warmer climates ~ short coated dog. •	A healthy breed they are prone to eye diseases. •	Easy keep when it comes to grooming. The Min Pin is a sweet and gentle dog, but they are prone to be demanding. Be certain that you don't spoil your dog, or he may become very difficult to live with. They are also very stubborn, so early training is essential. They are sturdy and proud and are quite courageous; often being described as a big dog in a little dog's body. They have a lot of energy and spirit, and are not couch potato dogs. They will do well with children, provided the children are well behaved and don't pester the dog. It's important that your children understand that this dog will need his space, and also to understand that, because of his size, he is somewhat easily injured. Min Pins don't act like toy dogs, so they often seem sturdier than they really are. 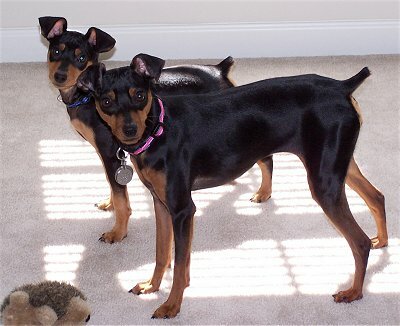 Min Pins can sometimes be aggressive with other dogs, so if you're planning to have other dogs in the home, be certain that they're introduced to the Min Pin at an early age. They are typically quite good with other types of pets in the home. This is a moderately protective dog; they will certainly bark to alert you. They are fairly suspicious of strangers by nature, but with proper training at a young age, they will do quite well with visitors in your home once they known that you are comfortable with them. But, be careful of training this dog to bark as a method of alarm; they are prone to excessive barking. This is a loyal and fun dog to have around. However, because they are very self-absorbed, willful and demanding by nature; early and consistent training is critical. However, they are also quite intelligent and eager to learn. Once your dominance is established, they will be eager to please you and quick to learn. Because they are small and easy to take care of, this is a perfect companion dog for a single person. Min Pins are said to be puppies for life. They are extremely playful and fun, but they are also very curious and prone to get into things and use things for toys that were not meant to be toys, and that may even be hazardous. It's important that your house be "puppy proofed" for this dog, and they will chew on almost anything. They are also prone to climbing, especially when they are unsupervised. For this reason, you must take care with the things that you leave on your counter tops and tables, too. This is a very easy breed to groom. They are average shedders, but their short hair is very easy to keep looking nice. Brush them with a firmly bristled brush a couple of times a week, and use a damp towel occasionally to wipe off excess hair. Originally, Min Pins were required to have docked tails and ears in order to compete in the show ring. Today, however docked ears are not mandatory, though docked tails are still required. Min Pins require just a small amount of food and should be fed high quality dry food for their optimum health. These dogs can become overweight, and dry dog food will help keep their weight under control. Dry food also helps prevent dental problems. This dog will likely do better with two small meals each day, rather than one large one. Miniature Pinschers need exercise. They will be happy with a small yard for running and playing or with a daily walk with their owners. Since this breed is prone to obesity, making sure that your dog gets regular exercise is even more important. However, it's also important to remember that they do not handle very hot or very cold temperatures very well, so outdoor exercise must be kept short in duration during extremes in weather. The Miniature Pinscher requires firm and consistent training, but once trained, they are a great companion dog. From an early age, they must understand that you are the "alpha dog", or they will be quite happy to run your household. Once they respect you as the alpha dog, they are very loyal and easy to please. Miniature Pinschers like to amuse you. So, during the course of training, don't ever laugh when he misbehaves, or the behavior will be set for life. You must be firm and serious when correcting him to avoid sending mixed signals. And, while your corrections must be firm and consistent, they should not be overly harsh, or he'll become scared and skittish. Once your dog learns that training is no nonsense time, he'll likely enjoy it, since he will be eager to learn. Miniature Pinschers require socialization at an early age, to prevent them from being wary of human strangers and to prevent them from being aggressive with other dogs. Puppy classes, where the puppies are introduced to each other and learn to share toys and water bowls would be perfect for this breed. Crate training works well for housebreaking the Min Pin. Because this breed can be stubborn and dominant, and because their accidents are easy to miss due to their size, it's important to be very persistent in house breaking them. If they have an accident that goes unnoticed, they will believe that going to the bathroom in the house is acceptable, and the habit will be nearly impossible to break. Keeping your puppy in his crate unless you are actively interacting with him will help ensure that there are no accidents. Puppies should not be allowed to roam the house unsupervised until they are consistently house trained. It's wise to leave your Min Pin in his crate when you leave the house even after he's house trained, to prevent him from getting into something that could be dangerous for him. Some owners of the Miniature Pinscher choose to paper train their dogs. Since they are not good in extreme temperatures, paper training prevents the dog from having to go outdoors when it is very cold or hot.